In November 1848, Almond D. Fisk received a patent for his Fisk Metallic Burial Case. 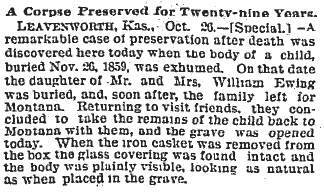 This metal container, shaped like a mummy case was pictured in many undertaker ads in the Chicago newspapers of the 1850s. The Advertisements menu bar, above, shows some of these classified ads. Although the Fisk Metallic Burial Case seems to have been the most popular, other brands of iron coffins were also available throughout the 1850s. Iron coffins are still found today with human remains intact due to the tight seal of the closed container. 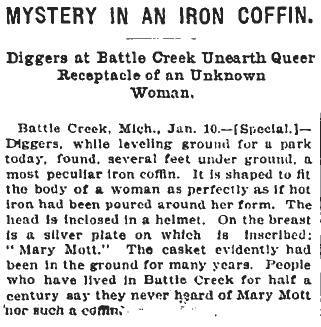 The tab above shows three newspaper articles from the late 19th century that tell of the state of remains when an iron coffin was opened years after a body was sealed inside. In 1998, during the excavation of the Lincoln Park grounds that became a parking facility for the Chicago History Museum, workers found a Fisk brand iron coffin. Go here to listen to a conversation with David Keene, the archaeologist who headed the excavation team during that project. 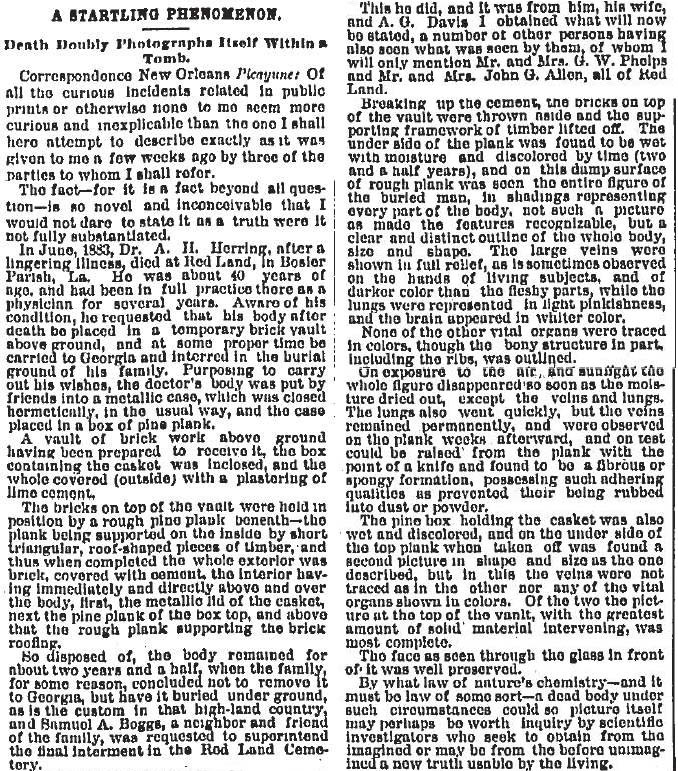 There is also a video recording of the removal of the iron coffin from Lincoln Park on that page of this Web Site. Cast iron burial case, ca. 1850-1860, based on a shrouded body Egyptian design by Almond D. Fisk of New York City. This casket was disinterred in 1969 during construction at an unmarked and long forgotten family cemetery. The unidentified and unembalmed 40-year old woman found inside was remarkably well preserved because the case was hermetically sealed. Cast iron burial case with imitation rosewood finish, ca. 1850-1869, based on a design by Almond Fisk. Both coffins are from the collection of the Illinois Funeral Service Foundation. 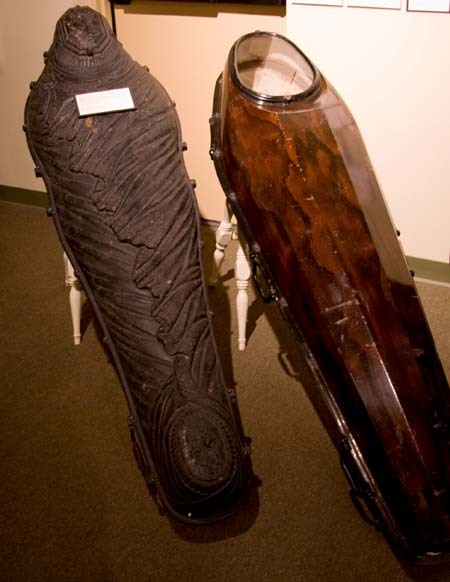 Go here to listen to a conversation with Jon N. Austin, the Executive Director of the Museum of Funeral Customs, about these two iron coffins and 19th century funerary customs. Almond D. Fisk, the inventor and holder for the patent of the metallic burial case that bears his name, lost everything in an 1850 fire that burned down his factory. Fisk, who received the patent for the iron coffin in 1848, died during that year of the fire. As detailed below, his widow was awarded monetary relief by an 1865 act of Congress that acknowledged her inherited right to a seven-year extension of the patent pertaining to the Fisk iron coffins. 37th Congress, 3rd Session, Rep. Com. No. 74. That it appears from the evidence in the case that the husband of the petitioner received a patent on the 14th of November, 1848, as the inventor of a metallic coffin, or burial case; that after the issue of said patent, and to enable him to commence the manufacture of said cases, he erected buildings and provided machinery at an expense of over $10,000; that in the fall of 1849 the said buildings were in the night time destroyed by fire, together with nearly all his machinery, tools, and the cases in process of finishing; that by this calamity the said Almond D. Fisk lost his entire capital, and that by exposure at the time of the fire he took a severe cold, from the effects of which he died in the month of October, 1850, leaving a widow, this petitioner, and four infant children. That, after the said fire, and before the death of said Almond D. Fisk, he borrowed about the sum of $15,000 to enable him to erect other buildings and procure other machinery, stock, &c., to secure the payment of which sum he mortgaged his patent and buildings in course of erection, machinery, and stock; that, in September, 1850, he put the mortgagors into possession of the mortgaged property; that the assignees of the original mortgagors surrendered the patent and obtained a reissue on the 6th day of March, 1860, for the remainder of the term it had to run; that, before the expiration of the said term, the petitioner applied to the Commissioner of Patents for an extension of the patent for seven years, as it stood upon the reissued patent of 1860, but this decision was made only a few days before the expiration of the original patent, so that sufficient time was not left to give the required notice of application for the extension of said original patent. And the committee further report that it appears from the evidence in the case that the said invention has been valuable to the public and profitable to the said assignees, but that the widow and children of the said almond D. Fisk have never received any benefit therefrom, with the exception of a small sum as a gratuity from said assignees. The committee therefore report back the bill referred to them in this case with an amendment, and recommend its passage. Chapter XL – An Act for the Relief of the Heirs of Almond D. Fisk, deceased. Be it enacted by the Senate and House of Representatives of the United States of America in Congress assembled, That Phebe Ann Fisk, as executrix of Almond D. Fisk, deceased, who obtained a patent for a “new and useful improvement in coffins,” dated the fourteenth day of November, eighteen hundred and forty-eight, for fourteen years, which has now expired, be authorized to apply to the commissioner of patents for an extension of said patent for seven years, under the rules and regulations now in force for the extension of patents, as if she had made application previous to its expiration, as required by law; and the Commissioner is directed to investigate and decide the application for extension on the same evidence and in the same manner as other applications for extension are decided, notwithstanding the surrender and reissue of March sixth, eighteen hundred and sixty: Provided, That the application for extension be made within thirty days from the approval of this act, and the decision of the commissioner be rendered within ninety days from the filing of said application in the patent office: And provided, also, That nothing herein shall be so construed as to hold responsible in damages any persons who may have manufactured coffins containing the aforesaid improvements between the expiration of the patent and the approval of this act.